The "Prey" novels by Pulitzer prize-winning journalist John Sandford consistently make the best-seller lists, but they are not for the faint of heart. Featuring Minneapolis Lieutenant Lucas Davenport, these thrillers are raw, graphic, and impossible to put down. 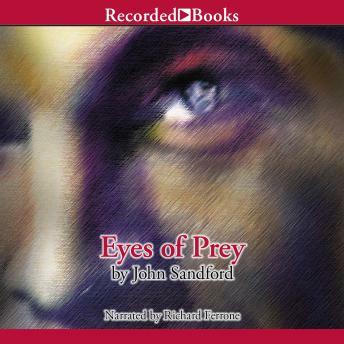 In Eyes of Prey, a depressed and unfocused Davenport takes on a macabre case, tracking down a serial killer who maims the eyes of his victims after he has murdered them. What a difference between Eyes of Prey and Silent Prey! I am glad that I read the faster paced Silent Prey first. Eyes of Prey is a lidded pot put on a slow boil. The pot's boiled over by the end of the book with lots of dead folks and Davenport out of a job. He's out of a job, but maybe he's getting his family back? Of course, Silent Prey answers those questions. Also, I like comparing the differences in Bekker. You see him as a pathologist, a murderer, and a junkie, whereas in Silent Prey, you see him primarily as a murderer and a junkie. I think by reading the books in the wrong order back-to-back, I picked up on things I wouldn't have otherwise. I don't know about other readers but reading this way reminds me of petting a cat's fur the wrong way.